I've Come to say Goodbye is the story of an incredible friendship between two unlikely people, a 50-something artist and a 32-year-old Indian spice merchant named Tarun. Over a ten-year period the author traveled back and forth to India spending time with Tarun in Udaipur, Rajasthan. She became part of his family and he became like a brother. Through his eyes, she saw and fell in love with India. It is a story that you will fall in love with too. Barbara Carmichael's understanding of India comes from her fifteen trips over the last decade and her ability to tell a story in a way that she hopes will inspire her readers to go on an adventure. 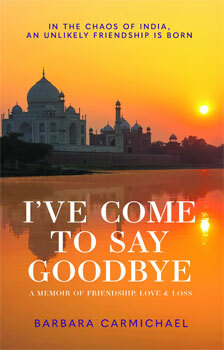 I've Come to Say Goodbye tells of her improbable friendship with a man named Tarun in the lake city of Udaipur. For her, it was the beginning of an incredible journey of self-discovery, and a love of India. Over time, Udaipur became like her second home, and Tarun and his family, a part of her family. Question: Why did I decide to write I've Come to Say Goodbye? Barbara Carmichael: Originally, my book was basically a travel memoir - about places I went and what I saw. However, with each trip I became closer to 'my Indian family' - a family I met in Udaipur on my first day in India, who took me under their wing and treated me as part of their family - I realised that my story was more about our connection and my friendship with Tarun, one of two brothers in this family, as well as the connection I felt with India and seeing India through their eyes. It was an unlikely friendship that I could never have envisaged. India became like a second home to me. I first went in 2005, and have been visiting every year - sometimes twice a year - since then. I wrote diaries and started putting the book together, but I could never visualise an ending for the book. I guess I didn't want one. I just wanted to keep going over and having these adventures. Between visits, we emailed, skyped regularly. When Tarun suddenly passed away, it seemed so important to finish the book and do it as a dedication to him and his family. After he died, I needed to go back to Udaipur, to say goodbye to him in the spiritual sense I guess - hence my title I've Come to Say Goodbye. Question: What was the most difficult part about writing I've Come to Say Goodbye? Barbara Carmichael: The most difficult part to write was the prologue and the epilogue…writing about the loss of my friend. The emotions just poured out of me - I could not type it without crying. I still cry when I read it. I've Come to Say Goodbye begins with me hearing of Tarun's death. The reader is then taken back as I reminisce over the times I had over the years of my journeys, and then returns to the present when I go to say goodbye. In the end, putting the book together - going back through all those years of our friendship and the adventures we had together, helped me cope with my grief. I went back to Udaipur to say goodbye to my dear friend Tarun. I wrote under the trees at Amet Haveli, by the side of the lake. It was a place that we always went. I felt his presence there. Those chapters are very emotional. The epilogue is a letter to him, written there. Question: What do I hope readers will take away from I've Come to Say Goodbye? Barbara Carmichael: I hope that my personal journey will give them an insight into an India that they will not find in a travel brochure and look beyond that which is obvious when they travel anywhere, not necessarily only India. I hope it also helps readers to understand the different layers of India as there are people who will go there and find it dirty, dusty, noisy and scary. It is a feeling that I can't describe but once India captures your heart, you will be there with me. I hope they can laugh with me at my funny experiences and cry with me at the sad ones. Question: What did you learn about yourself when writing I've Come to say Goodbye? Barbara Carmichael: I learnt that I can be brave, I can face danger and I can trust my instincts. I learnt that at my mature age, I could find the confidence to take myself on a life changing journey. If you want to see the real India, you need to walk with the people - people of all walks. You do not see India by buzzing between expensive hotels. Talk to the people and more importantly, listen. I buy little marble carvings from a little man who sits on a hessian bag working away in the heat. When I first went to India, I would have walked past him, dismissed him, and seen him as a beggar, but one day I stopped and I met him. I watched him sculpt an elephant out of a scrap of marble. He was clever... talented. He told me about his family. Last trip I went to see him and he was sad. "My wife died," he told me. He grabbed my hand and held it. I told him I was sorry and I genuinely was, and he knew it. It was important to him that I cared. That was a humbling experience for me. I learnt patience and I learnt that I had a heart big enough to include another whole family and the joy to be included in theirs, when all they wanted in return was my love to them.